Cyanate lyase (also known as cyanase) EC:4.2.1.104 is responsible for the hydrolysis of cyanate, allowing organisms that possess the enzyme to overcome the toxicity of environmental cyanate. This enzyme is composed of two domains, an N-terminal helix-turn-helix and this structurally unique C-terminal domain ((PUBMED:10801492)). Some bacteria can overcome the toxicity of environmental cyanate by hydrolysis of cyanate. This reaction is catalyzed by cyanate lyase (also known as cyanase) [(PUBMED:3049588)]. Cyanate lyase is found in bacteria and plants and catalyzes the reaction of cyanate with bicarbonate to produce ammonia and carbon dioxide. The cyanate lyase monomer is composed of two domains. The N-terminal domain shows structural similarity to the DNA-binding alpha-helix bundle motif. 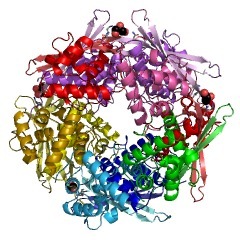 The C-terminal domain has an 'open fold' with no structural homology to other proteins. The dimer structure reveals the C-terminal domains to be intertwined, and the decamer is formed by a pentamer of these dimers. The active site of the enzyme is located between dimers and is comprised of residues from four adjacent subunits of the homodecamer [(PUBMED:10801492)]. There are 3452 Cyanate_lyase domains in 3452 proteins in SMART's nrdb database. Taxonomic distribution of proteins containing Cyanate_lyase domain. This tree includes only several representative species. The complete taxonomic breakdown of all proteins with Cyanate_lyase domain is also avaliable. Click on the protein counts, or double click on taxonomic names to display all proteins containing Cyanate_lyase domain in the selected taxonomic class. Structure of cyanase reveals that a novel dimeric and decameric arrangement ofsubunits is required for formation of the enzyme active site. 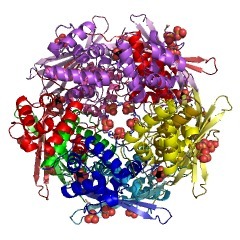 BACKGROUND: Cyanase is an enzyme found in bacteria and plants that catalyzes the reaction of cyanate with bicarbonate to produce ammonia and carbon dioxide. InEscherichia coli, cyanase is induced from the cyn operon in response toextracellular cyanate. The enzyme is functionally active as a homodecamer of 17kDa subunits, and displays half-site binding of substrates or substrate analogs. 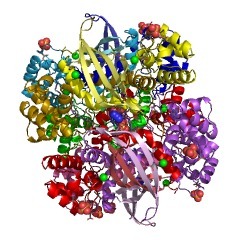 The enzyme shows no significant amino acid sequence homology with other proteins.RESULTS: We have determined the crystal structure of cyanase at 1.65 A resolutionusing the multiwavelength anomalous diffraction (MAD) method. Cyanase crystalsare triclinic and contain one homodecamer in the asymmetric unit.Selenomethionine-labeled protein offers 40 selenium atoms for use in phasing.Structures of cyanase with bound chloride or oxalate anions, inhibitors of theenzyme, allowed identification of the active site. CONCLUSIONS: The cyanasemonomer is composed of two domains. The N-terminal domain shows structuralsimilarity to the DNA-binding alpha-helix bundle motif. 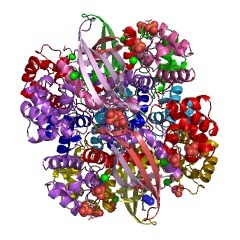 The C-terminal domain hasan 'open fold' with no structural homology to other proteins. 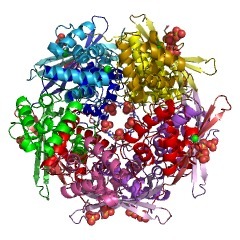 The subunits ofcyanase are arranged in a novel manner both at the dimer and decamer level. Thedimer structure reveals the C-terminal domains to be intertwined, and the decameris formed by a pentamer of these dimers. The active site of the enzyme is locatedbetween dimers and is comprised of residues from four adjacent subunits of thehomodecamer. The structural data allow a conceivable reaction mechanism to beproposed. Characterization of the cyn operon in Escherichia coli K12. Escherichia coli can overcome the toxicity of environmental cyanate by hydrolysisof cyanate to ammonia and bicarbonate. This reaction is catalyzed by the enzymecyanase, encoded by the cynS gene. The nucleotide sequence of cynS has beenreported (Sung, Y.-c., Anderson, P. M., and Fuchs, J. A. (1987) J. Bacteriol.169, 5224-5230). The nucleotide sequence of the complete cyn operon has now been determined. The cyn operon is approximately 2600 base pairs and includes cynT,cynS, and cynX, which encode cyanate permease, cyanase, and a protein of unknown function, respectively. Two cyanate-inducible transcripts of 1500 and 2500nucleotides, respectively, were detected by Northern blot analysis. S1 nucleasemapping experiments indicated that two different cyn mRNAs have a common 5'-endand two different 3'-ends. One 3'-end was located within the coding region ofcynX, whereas the other 3'-end includes the entire DNA sequence of cynX. Thelonger transcript contained 98 nucleotides complementary to lac mRNA produced by the predominant lac transcription termination sequence. Termination vectors were used to show that both 3'-ends were generated by sequences that causedtranscriptional termination in vivo. Expression vectors were used to demonstrate that a protein corresponding to the expected size was synthesized from the DNAfragment containing the open reading frame designated cynX. The predicted aminoacid sequence of cynX indicates that it is a very hydrophobic protein. The level of cynX expression was significantly less than that of cynT or cynS expression.